Andy comes to us via the San Francisco SPCA, where he spent five years as webmaster, copywriter, and designer. Here at the KSMP, he designed, built and maintains the sheltermedicine.com website you’re looking at right now. See a problem? Please let him know! His other responsibilities include the occasional writing assignment, editing C4C Bootcamp video and audio, general tech support, and design for web and print (or as they say here, “making things pretty”). 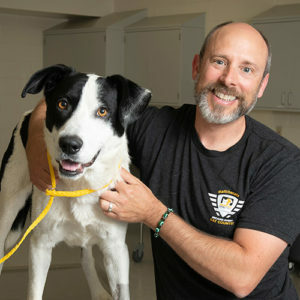 He’s grateful for the opportunity to support the best dang team imaginable as they improve the lives of shelter animals and workers across North America… and eventually the world!